March 3, 2010 - The James Webb Space Telescope reached a mission-readiness landmark when it’s first primary mirror segment was cryo-polished to its required prescription as measured at operational cryogenic temperatures. 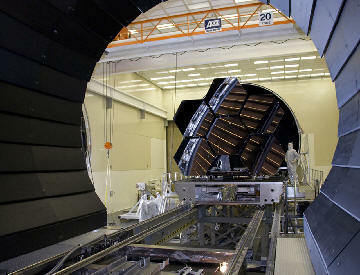 This achievement sets the stage for a successful polishing process for the remaining 18 flight mirror segments. Northrop Grumman Corporation is leading Webb's design and development effort for NASA's Goddard Space Flight Center. "Many predicted it would take us multiple iterations to successfully polish these mirror segments to achieve the correct optical prescription at the telescope's operating temperatures, but we did it on our first try," said Scott Willoughby, Webb Telescope Program Manager for Northrop Grumman Aerospace Systems. "All our budgets and schedules are based on this and it's a confirmation of the basic plan we proposed ten years ago." "The completion of cryogenic polishing of the engineering development unit primary mirror segment is a hugely significant milestone for the Webb telescope project that demonstrates that our primary mirror segments can be completed on schedule while meeting the performance necessary for science," said Lee Feinberg, NASA Webb Optical Telescope Element Manager at the Goddard Space Flight Center, Greenbelt, Md. Cryogenic polishing, or cryo-null figuring, ensures that when the mirror reaches its extremely cold operating temperature, its shape will conform to the exact optical prescription required to collect accurate infrared images of distant stars and galaxies. The engineering development unit mirror, which will be used as a flight spare, was cryotested in the X-Ray and Cryogenic Facility (XRCF) at NASA's Marshall Space Flight Center in Huntsville, Ala. The mirror polishing was performed at Tinsley Laboratories, Inc. in Richmond, Calif. Late last year, the mirror segment met flight requirements at ambient temperatures. "For validation purposes, we're planning four sets of completely different cross checks and verification tests to authenticate the outcome of the mirror cryotests," said Scott Texter, Northrop Grumman Webb Optical Telescope Element Manager. "If any discrepancies surface, we can then investigate and re-verify." NASA Marshall and principal optical contractor Ball Aerospace will conduct separate verification tests using different computer generated holographic null tools. NASA Goddard will use its own testing equipment and measurement methods in its clean room; testing at Johnson Space Flight Center will use a reflective null tool manufactured by optical integration and test partner ITT; and polishing partner Tinsley Labs will make measurements using their own independent method of calibrating their computer generated holographic null tools. The James Webb Space Telescope is the next-generation premier space observatory, exploring deep space phenomena from distant galaxies to nearby planets and stars. The Webb Telescope will give scientists clues about the formation of the universe and the evolution of our own solar system, from the first light after the Big Bang to the formation of star systems capable of supporting life on planets like Earth. Expected to launch in 2014, the telescope is a joint project of NASA, the European Space Agency and the Canadian Space Agency.